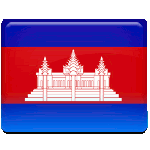 King Norodom Sihamoni's Coronation Day is a Cambodian public holiday celebrated on October 29. The reigning King of Cambodia ascended the throne in 2004, following the abdication of his father Norodom Sihanouk. Sihamoni was born to King Sihanouk and Queen Monineath in 1953. He spent most of his life outside Cambodia. Sihamoni studied classical dance in Czechoslovakia, then left for North Korea to study filmmaking. When the Khmer Rouge seized power in Cambodia, he spent two years under house arrest. In 1981, Sihamoni moved to France. While living there, the prince worked as a classical dance instructor. In 1993, he was appointed Cambodia's delegate to UNESCO. He was previously offered an appointment as Cambodia’s ambassador to France, but refused. In 2004, King Norodom Sihanouk unexpectedly abdicated due to ill health. A special nine-member throne council selected Sihamoni to become the next king. The prince returned to Cambodia and was formally inaugurated as King on October 29, 2004. King Norodom Sihamoni's Coronation Day is celebrated nationwide. The holiday is marked with colorful parades, cultural events, firework displays and other festive events and activities.